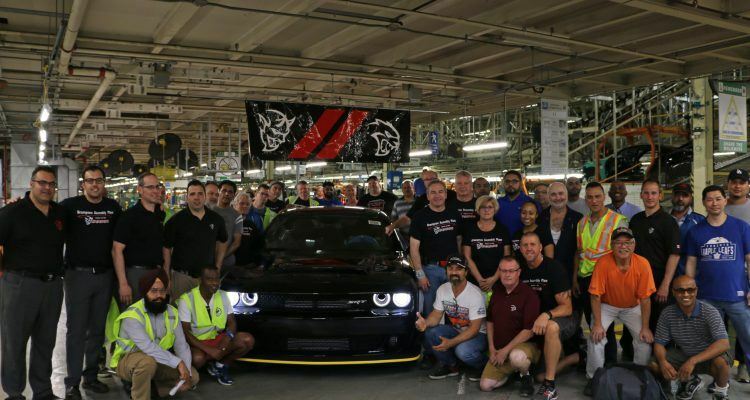 The last 2018 Dodge Challenger SRT Demon has rolled off the line at the Brampton Assembly Plant in Ontario, Canada. The powerful muscle car is headed for an upfit center where the final stages of production will commence, which includes a hand-painted and exclusive Viper Red exterior color, the addition of 18-inch special drag radial tires, and a one-of-a-kind VIN number instrument panel. This final Dodge Challenger SRT Demon and the last 2017 Dodge Viper will be auctioned as a pair as part of The Ultimate Last Chance program, with all proceeds benefiting the United Way. 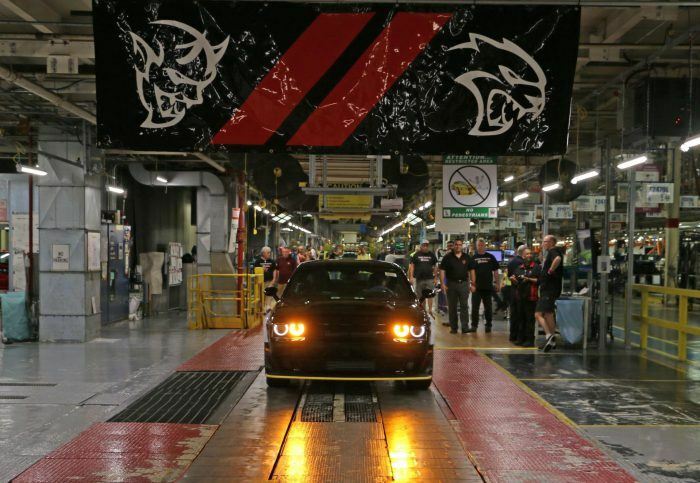 The last 2018 Dodge Challenger SRT Demon at the Brampton Assembly Plant in Ontario, Canada. Photo: FCA US LLC. The winning bidder at the June 20th-23rd Barrett-Jackson Northeast Auction, held at the Mohegan Sun Resort in Uncasville, Connecticut, will own a combined 1,485 horsepower: the 840 horsepower Dodge Challenger SRT Demon and the 645 horsepower Dodge Viper with an 8.4-liter V10. Viper production concluded at the Conner Avenue Assembly Plant in Detroit last summer, although rumors are swirling about the Viper’s return. The last production 2017 Dodge Viper is styled in homage to the first-generation Viper RT/10. The car (VIN ending in 731948) features exterior carbon fiber accents, black Alcantara leather seats, and a special authenticity kit. While the Viper had a 25-year run, production of the Challenger SRT Demon was limited to just one year and 3,300 units. No Comments on "Final 2018 Dodge Challenger SRT Demon Assembled"